Hi, I am interested in your 2005 Dodge Magnum (stock #4838-CHA) listed on Autotrader for $17,995. I'd like to get more information about this vehicle and confirm its availability. Time to step back and say Wow! 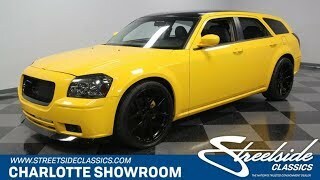 Thats because this 2005 Dodge Magnum is quite a custom machine that has an upgraded 450+ horsepower Hemi heart to back up its bold yellow attitude. So when its available for such an obtainable price, you know its time to pay attention. That yellow is bolder than anything that came from them factory, and in fact, looks more like they borrowed it from a Dodge Viper. So this one has attitude that radiates from blocks away. But also take a moment to understand the level of detail that went into this custom. The black roof, dark tinted windows, smoked headlights & taillights, custom SRT-style mesh grille, and front splitter give this a terrific dark side that goes perfectly against the yellow. And those gloss black 22-inch wheels look like they belong on a Hellcat. Dont you just love the detail, like how the brake calipers are radiating in yellow too? Inside is a loaded and versatile machine. Not much was changed from stock, which is a good thing. After all, you get a comfy leather interior with full-sized comfort for everyone. The Magnums unique profile means wagon-like versatility with a fastback-style profile. So you have room to carry family and friends while also taking on plenty of cargo ideal for everything from tailgating to a golf weekend. But even if youre just commuting solo, youll enjoy this Dodge. Its loaded with all the right features, including power seats, air conditioning, power windows, power locks, keyless entry, dual airbags, cruise control, power steering, a four-speed automatic transmission w/overdrive, and an upgraded AM/FM/CD stereo with touchscreen interface. Youre going to love lifting the hood on this one wherever you go, because the same yellow and black attitude of the exterior was carefully crafted in the engine bay, too. And youre going to love this motor for more than just its looks. This is a custom 5.7-liter Hemi V8 that was built with decked heads to increase the compression to 10.1:1, and there was a further investment in a ton of go-fast goodies. It includes a Comp Cams camshaft, Comp Cams Beehive springs, Cloyes timing set, SRT 6.1 yellow-tip injectors, DiabloSport Tuner U7135, Mopar cold air intake, and Kooks headers. The full package is estimated at 450+ horsepower, and the thunder this brings to the streets lets everyone know it the moment you twist the key. While youll love the idea of serious Mopar muscle tuned like old-school muscle cars, remember this is also a modern machine. That means you get great driving features like a fully independent suspension, four-wheel disc brakes, and the grip of modern performance tires. Serious power and a bold presentation are delivered in a package thats daily-driver practical. So when its all priced so nicely, you know this is a deal you need to hurry on before its gone. Call now!